This is the well known Corn Poppy or Field Poppy, once common as a wild flower in our fields. The Corn Poppy has deep scarlet flowers in late May to July and grows to a height of 30-60cm. It is best grown in profusion in a meadow or wildflower garden. This is a hardy annual plant, and should be sown directly in the ground in autumn and/or spring through to early summer. Several sowings at different times will give a longer display of flowers, with plants flowering about two months after germination in spring. 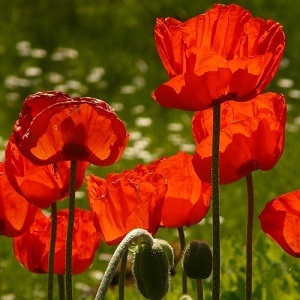 Poppies flower best in full sun and will tolerate most soil types except heavy clay. Best not to sow in trays, unless you sow in plug trays and use an anti-fungal spray on young seedlings, as the roots don’t like disturbance. Pack of 1g (approx 11000) small seeds. Sow in autumn and/or spring to early summer. Sowing instructions and a colour photo are printed on the packet. Easy to grow. Sow in spring or autumn. Sow in spring and/or autumn directly into cultivated soil. Water gently. Germination takes 10-14 days when there is enough light and warmth. Sowing at different times will give a longer display of flowers. Or sow in plug trays of seed compost, being careful to avoid root disturbance and damping off – consider spraying trays/young seedlings with a garden fungicide. Plants grow, flower and then die in the same year. Once established, plants need little care and attention. The plants form attractive seedheads after flowering, which look good on plants overwinter.